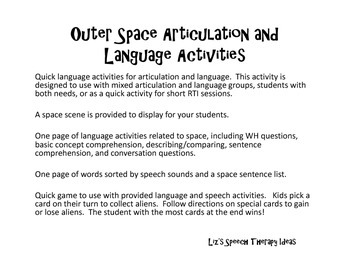 Language and Articulation Activities in Outer Space! 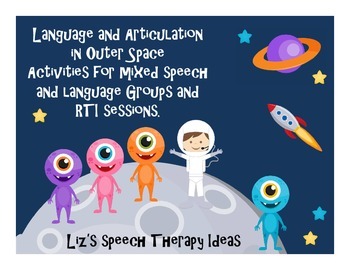 Quick language activities for articulation and language. This activity is designed to use with mixed articulation and language groups, students with both needs, or as a quick activity for short RTI sessions. 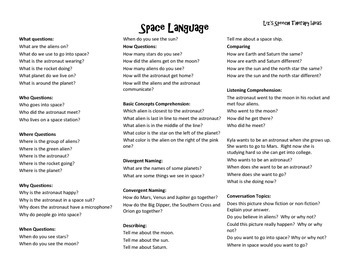 One page of language activities related to space, including WH questions, basic concept comprehension, describing/comparing, sentence comprehension, and conversation questions. 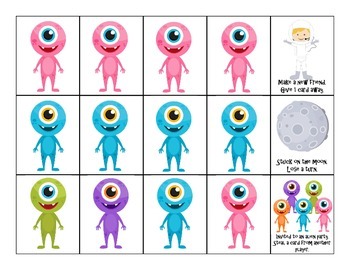 Quick game to use with provided language and speech activities. Kids pick a card on their turn to collect aliens. Follow directions on special cards to gain or lose aliens. The student with the most cards at the end wins!